Finally back in print on vinyl after 22 years! Recorded live at The Great American Music Hall in 1975, this is classic live Dead. 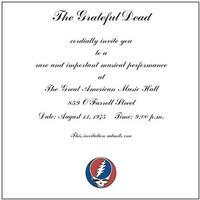 For a legacy filled with legendary performances, the Grateful Dead Live at the Great American Music Hall in San Francisco on August 13th 1975 stands out. The band only played four shows during that entire year! (Remarkable for a band that toured non-stop for decades) and at their August 13th show, they rolled multi-track tape (which allowed for the band decades later to properly mix the show). Because the Great American Music Hall holds less than 1,000 people (another unique thing about this show), it was an invitation-only performance in which the band debuted their recent studio album Blues For Allah in a live setting. The Introduction itself is worth the listen ! But the show is amazing with great attention to detail and sound . The band is on fire for this show. Very exciting to have this on vinyl.